Pacira Pharmaceuticals Inc.’s proposed deal to buy Myoscience Inc., announced earlier this month, highlights new kinds of opportunities presented by the opioid epidemic for life sciences companies and their investors and is perhaps a nudge for companies to think more holistically. Pacira, maker of Exparel (bupivacaine liposome injectable suspension), a rapidly-growing analgesic for local peri-operative indications, is buying the small developer of an innovative, point of care cryoanalgesic device, iovera, for $120 million in cash and up to $100 million in milestones through 2023. Iovera is a percutaneous non-systemic treatment based on proven cold therapy, with 510(k) clearance for use in knee osteoarthritis (KOA). It provides immediate and long-term pain relief by freezing certain peripheral nerves around the knee. The acquisition appears to be good for both parties. Pacira is getting a technology that has IP protection and is somewhat de-risked, with a fair amount of clinical data behind it, including published results of a multi-center, randomized, double-blind, sham-controlled trial, FDA clearance, and a commercial track record. 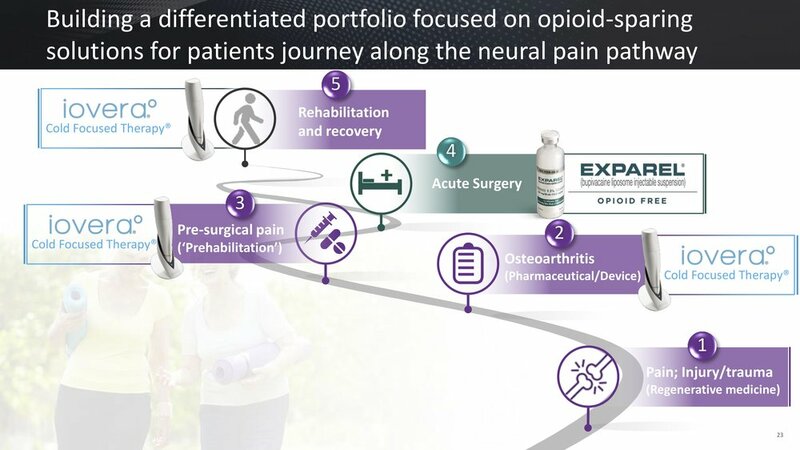 Exparel, its only product, had sales of $331 million in 2018 and is growing at more than 20% a year, based on claims of being the only opioid-free long-acting local and regional analgesic approved for several indications. Exparel’s availability is one of the factors driving the ongoing shift of certain spine procedures and total joint arthroplasty from inpatient to outpatient settings, a trend that is likely to accelerate given CMS assignment of a unique billing code for the drug in ambulatory centers as of January 2019. The terms also appear to be fair, if not great, for Myoscience. To begin with, the company has certainly had its share of ups and downs, and its investors—led by two private equity firms—aren’t getting a huge return on their money, even if they manage to capture all associated milestones. Founded in 2005, the company is a pivot, as its founders originally conceived the technology for aesthetic indications attracted by the appeal of the out-of-pocket pay market, but found going against Botox to be too tough, says Myoscience’s president and CEO and President Timothy Still. By 2015-16, a new management team was onto a better strategy of “going after the peripheral nerve market,” using the same technology. A significant body of research showed cryoneurolysis, as the technology is called, works, and the company set out with a “laser focus” to get its device approved, at least initially, for knee osteoarthritis. Still, who joined the company only last fall, had the mandate of raising funds to build out its commercial operations. Then Pacira came calling. Despite investments totaling close to $170 million since its inception, and FDA approval (albeit 510(k)) almost two years ago, iovera had generated only $6 million in sales in 2018—and was projected to bring in $11 million this year. So, while the deal was tough, it seemed perhaps the best Myoscience could hope for. How it all comes together will be worth watching. Looking to pharma as an exit is an outlier for venture or PE-backed small medtech companies—although such combinations happen from time to time. Endo Pharmaceuticals’ deal for American Medical Systems in 2011 comes to mind, mostly as a cautionary nightmare—albeit on a much, much larger scale and driven by different strategic motives. Endo, then heavily dependent on its blockbuster pain medication Lidoderm, bought AMC as part of a diversification strategy. But despite presentations to Wall Street regarding synergies, there were none, and then AMC ran into litigation issues over pelvic meshes, leading Endo to eventually sell it at a huge loss. The reference admittedly is a stretch, given the partners’ different motivations, size, and multiple other differentiators —but one I’m taking an author’s liberty to make as a cautionary note on the downside of device-drug deals. The Pacira-Myoscience acquisition indicates a willingness to think in a coordinated fashion about two areas of great preoccupation for device companies—pain management and treatment procedures, as it focuses importantly on two particularly frustrating current clinical challenges: countering the opioid epidemic and filling in the glaring, urgent gap in non-surgical treatments for osteoarthritis, particularly in the knee. After all, integrated, multi-disciplinary solutions at conquering both of these beasts may be the only rational way to go.